​Although the nature of the guru-disciple relationship in Hindu culture has already been briefly mentioned in broad terms in other sections of this website, its characteristics will now be described in greater detail. This crucial feature of Hinduism is often misunderstood even by those who identify themselves as Hindus, what to speak of those who view Hinduism with only a partial or incorrect understanding of its principles. Because there are many aspects of the guru-disciple relationship, this section is a work in progress which may be checked for updates from time to time. As with many spiritual and cultural traditions, the idea of having a spiritual teacher/guru is not a controversial one. Within Hinduism, it’s considered to be a self-evident matter of common sense—a very natural and universal feature of learning that transcends considerations such as culture and philosophical outlook. In Hindu culture, our parents are described as being our first gurus—the first of the many kinds of teachers we will trust and take advice from during the course of our lives. And so the word ‘guru’ may be, and oftentimes is, used to indicate an expert teacher of any subject—a music guru, a yoga asana/posture guru, a financial guru, a computer guru, a martial arts guru, and so on. In some cases these gurus are also known as masters, such as a yoga asana master or a Kung Fu master. If a person has an opportunity to study some particular art or field of knowledge under the guidance of such an expert/master, then it is considered to be a great privilege, and this will naturally and quite rightly manifest as respect for the teacher. Similarly, if we want to become proficient in spiritual understanding, the Hindu scriptures advise us to respectfully approach a guru who is an expert or master in that particular field. One who approaches a genuine spiritual master, can understand everything about spiritual realization. While Christians, Muslims, Judaists, Buddhists, and other spiritual aspirants may not commonly use the term ‘guru’ when referring to their monks, priests, pastors, imams, rabbis and so on, such teachers are gurus nonetheless. In this way, it’s perfectly natural that those who are interested in developing their spiritual understanding will try to learn from an expert spiritual teacher (guru). Is it Necessary to Have a Spiritual Master? According to both the ancient Hindu scriptures and the New Testament, used within Christianity, the concept of a spiritual guru is not only valid, but it is necessary. But how can they call on God unless they believe in him? And how can they believe in Him if they have never heard about Him? And how can they hear about him unless someone tells them? And how can they be told if no one is sent to tell them? As the scriptures (Isaiah 52:7) say, "How beautiful are the feet of the messengers who announce the good news of God." More broadly, the actions of every teacher (whether theistic or atheistic) who has ever written a book, given a sermon/speech, or gone on television, radio, the internet, or social media, testifies to their belief in the general principle that people need a teacher/guru, or else why would they be attempting to communicate? It also shows that they believe themselves to be teachers of some significance, and that their audiences should take their opinions/teachings seriously. There are many theists and atheists who say they don’t need a teacher. Yet the very fact that they go to a church, temple, or mosque to hear someone speak about God, or attend a university, search the internet, or read a book about philosophy or spiritual knowledge, is an acknowledgement that they accept the value of of learning from those who know more than them about a particular subject. With regard to Hinduism, some people may say that they don’t need a guru because they have the scriptures as their teacher, and yet the actual need for a spiritual teacher is described in the very scriptures they claim to follow. Simply by studying the Vedic (Hindu) scriptures which are variegated, one cannot come to the right path by which religious principles are understood. The solid truth of religious principles is hidden in the heart of an unadulterated, self-realized person. Consequently, as the śāstras (scriptures) confirm, one should accept whatever progressive path the mahājanas (great spiritually realized souls) advocate. Why is a Guru Sometimes Described as a Representative of God? My teaching is not my own. It comes from God who sent me. In the Koran, Muhammad, Jesus Christ and Old Testament prophets including Abraham and Moses, are all described as messengers of God. We have inspired you O Muhammad, just as we inspired Noah and the prophets after him ~ Abraham, Ishmael, Isaac, Jacob and his twelve sons, Jesus, Job, Jonah, Aaron, and Solomon. And to David we gave the Psalms. And messengers we have mentioned to you before, and messengers we have not mentioned to you ~ and to Moses, Allah spoke directly. In fact, there are countless people who are directly and indirectly acting as representatives of God by speaking about God from one kind of religious or spiritual pulpit or another. For example, if someone quotes scripture, whether it be the Bible, Koran, or Bhagavad Gita, and then comments upon those verses, as soon as they do this, they are attempting to act as a representative of God. In other words, the very fact that a person is speaking about God, means that that they are acting to enlighten their audience about God, and this in turn means that they are acting as a representative/ambassador/messenger of God. Whether it’s a priest, pastor, rabbi, imam, guru, or even an ordinary person without any such official title—whether they are perfect representatives of God or not—whenever they open their mouths to speak about God, they are attempting to represent Him to one degree or another. In Catholicism and a number of Orthodox Christian traditions there is a formalized acceptance of not only the general idea of representatives of God, but a whole hierarchy of them. 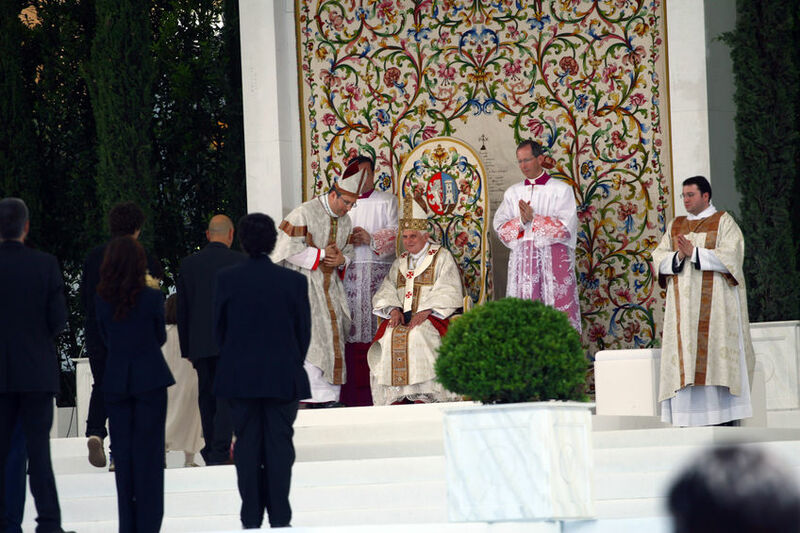 At the top of the Catholic hierarchy is the Pope, who is also known as His Holiness, the Supreme Pastor and the Vicar of Christ, or sometimes the Vicar of God. The word ‘vicar’ is derived from ‘vicariously’ which refers to functioning as a substitute, and in this way the Vicar of God literally means the representative of God on earth. 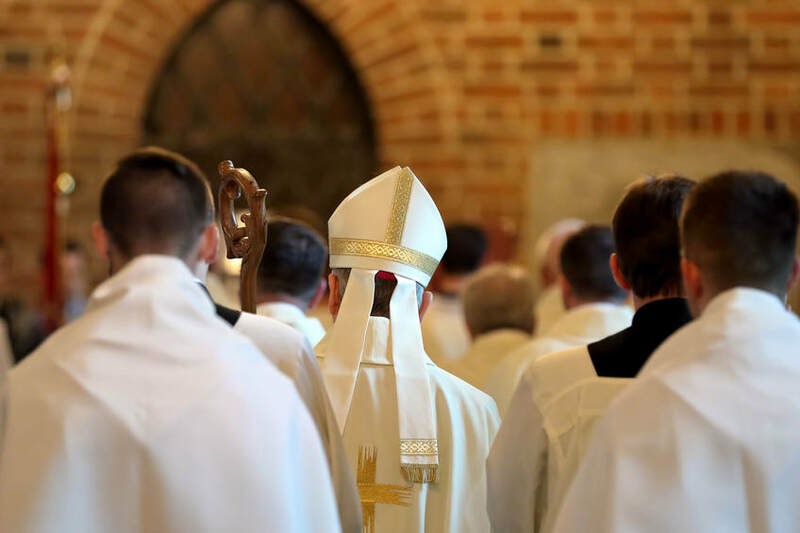 A regular priest for example is usually referred to as ‘Father’, while the Pope is often referred to as the ‘Holy Father’ or sometimes the ‘Most Holy Father’. And so the titles of Pope, Cardinal, Archbishop, Bishop, Priest, and a number of others all indicate certain levels of authority in representing God. A Cardinal is sometimes addressed as ‘Your Eminence’, while Archbishops and Bishops are usually greeted as ‘Your Excellency’ or ‘Your Grace’. Likewise, in Hinduism there are many titles or designations that describe the qualities of spiritually realized teachers. ‘Guru’ refers to a teacher of any subject, but more commonly, it refers to spiritual teachers—representatives of God, or representatives of the ultimate Absolute Truth. An ‘Acharya’ is also a guru, but this word specifically refers to conduct. An acharya is a teacher by personal example but the term is also commonly applied to the head of a spiritual/religious institution within Hinduism. ‘Sadhu’ refers to those who are committed to a life of austerity, and who tend to live reclusively on the fringes of society so that they can concentrate on their spiritual development without being disturbed by the hustle and bustle of everyday life. ‘Rishi’ refers to an insightful sage who has great wisdom, and ‘Paramahamsa’ refers to the highest swan-like personality, who has completely transcended all self-centered (material) desires, and who is thus the true and honest friend of every living being. In the diverse world of Hinduism, a number of conceptions about God are held by a variety of spiritual aspirants and their teachers. While all of them accept that God is the source of all spiritual and material energies, there is no universal agreement with regard to the actual nature of God. This has largely stemmed from the fact that the Vedas propound that the Absolute Truth (God) is manifest in 3 features – as Brahman (an impersonal Ocean of Spiritual Energy or Light), Paramatma (the localized feature of the Supreme Lord who resides within the heart of all living beings within the material creation) and Bhagavan (the Supreme Personality of Godhead who resides in a spiritual dimension/world and is eternally engaged in loving relationships with His loving servants). Different schools of philosophy and different lineages have tended to be more focused on one or the other of these features which gives rise to this idea of no universal agreement with regards to the nature of God. In the highly regarded Bhagavat Purana which is sometimes described as the essence or the cream of all the Hindu scriptures, the position of the representative of God is further described. Sometimes this statement is taken to mean that the guru (acharya) actually is God, but this is a great mistake. Rather, it simply means that the guru is the confidential ambassador/representative of God. When the ambassador of a certain country delivers a message on behalf of their president to another country, this situation is understood to be non-different from the president himself delivering the message. In other words, the ambassador is not an ordinary person. He is the highly respected personal representative of the president, and therefore his presence in that ambassadorial sense, is accepted as being non-different to the presence of his president. On the basis of this understanding, Vaishnava Hindus naturally offer special respect to those who they perceive to be representatives of God. Why is the Spiritual Guru so Greatly Respected? In every culture, people offer each other respect in a variety of ways, according to the status and/or quality of the person who is being respected. To be truly respectful of others required an attitude of humility, and this inner attitude is often expressed externally by respectful words and/or by physical gestures such as standing and/or clapping, slightly bowing the head, slightly bending the whole torso, bowing low from the waist, or gently holding the palms together in front of the chest. One of the common features of both theistic and atheistic societies is that special respect is offered to those who are in positions of leadership. For example, people often stand and clap or kneel, or curtsy or bow in one way or another when the ruling monarch or head of state enters a room, especially during ceremonial occasions. Moreover, these leaders are usually addressed in a very respectful manner—Madam President, Your Majesty, Your Highness, and so on. And far beyond these basic yet special courtesies, heads of state are also commonly respected by providing them with a luxurious residence and every kind of convenience at public expense. Lower on the ladder of social status, we still find expressions of respect, though usually not to the same degree. In courtrooms, the highest seat is reserved for the judge, and people are expected to stand as the judge enters the court, and to address him as Your Honor. Military personnel must salute and respect their superiors by addressing them as Sir or Ma’am, and students in many schools are expected to stand when their teachers arrive and depart. Oftentimes respect is offered mutually. For example, a captain will salute a general and the general will similarly respond. In concerts, the audience will sometimes stand and clap, while performers often respect their audience with a low bow from the waist. In many indigenous cultures, the wise elders are treated with the greatest respect because they are the guardians of their ancient traditions. Likewise, as a sign of appreciation, students regularly offer their Buddhist teachers all kinds of respect, even to the point of bowing before them. Such displays of reverence are considered to be quite acceptable, even by many of those who are committed members of secular society. ​In fact, in some quarters of secular society, such as the world of traditional martial arts, it is also a common practice to show respect for one’s teachers by bowing before them. But beyond these examples of respect and mutual respect, a much deeper reason for respecting others may be found in the Hindu scriptures. The Supreme Lord is like a great blazing fire, and the living entities are like small sparks of that fire. In other words, all living entities are the spiritual children of God, and those who accept this reality will naturally offer respect to all their fellow children of God, regardless of materialistic/superficial considerations such as race and social status. In many cultures, this respect is simply offered mentally, or by shaking hands and/or a slight bowing of the head, while in the world of Hinduism, people commonly offer each other respect by gently pressing the palms together in front of their chest and saying ‘namaste’ which literally means ‘I bow to you’. Going even further, we come to what many millions of people all over the world consider to be the most important expression of respect—that which is offered to their spiritual leaders/gurus. In other words, it’s quite natural that teachers of spiritual knowledge (the highest and most important knowledge) will be offered the greatest respect. 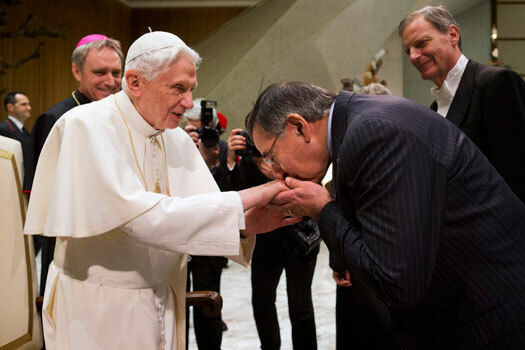 The Catholic Pope is perhaps the most widely known example of a spiritual leader receiving such special respect. He has special titles, he wears special clothes, he has many assistants who take care of all his personal requirements, he has secretaries, he lives in special apartments, he eats specially prepared food, he rides in chauffer driven cars, he flies in chartered aircraft, and so on. 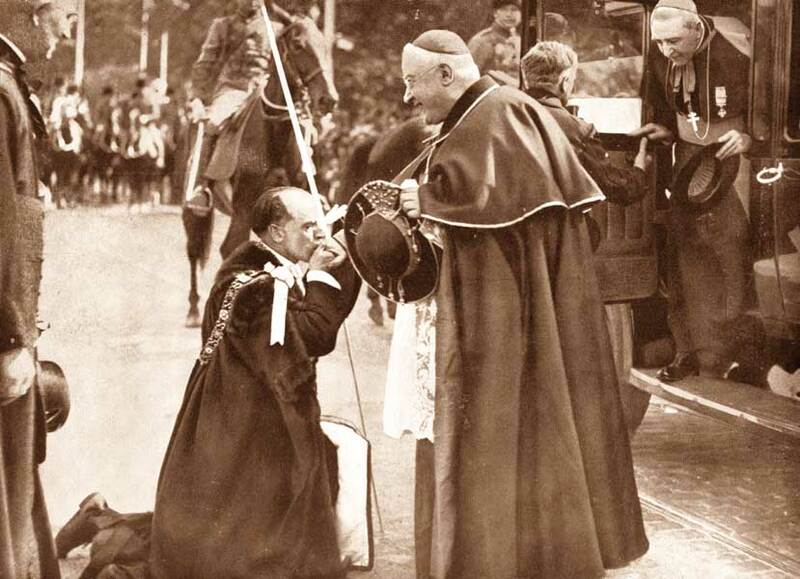 He is addressed as ‘Holy Father’ or ‘Your Holiness’, people bow to him in one way or another, and many fervently hope for the opportunity to kneel before him and kiss his ring. ​While there is no Hindu Pope, and the specific details vary from case to case, Hindus nevertheless have a comparable attitude towards their spiritual gurus—they want to offer them every kind of special respect. Furthermore, similar expressions of deep respect for spiritual teachers also feature in other theistic traditions, including Islam and Orthodox Christianity ~and some of the widely accepted precedents for this deep respect may be found in the Old Testament. Then ( the Babylonian) King Nebuchadnezzar fell on his face and did homage to ( the prophet) Daniel, and gave orders to present to him an offering and fragrant incense. When the group of prophets from Jericho saw from a distance what happened, they exclaimed, "Elijah's spirit rests upon Elisha!" And they went to meet him and bowed to the ground before him. In harmony with these descriptions in the Old Testament, Hindus also offer respect to their representatives of God by touching their forehead to the ground with an attitude of humility. As we earlier described, some people slightly lower their head as a gesture of respect, some people lower their head even further with the bending of the torso, some people lower the head still further by bowing from the waist, and in the ultimate gesture of respect and humility, one may lower their head to the point where it touches the ground. It’s important to note that this ancient tradition of bowing to the guru, is a deeply considered, heartfelt and voluntary offering of respect.